NOTE: Refer to the Exploded View as needed during the following procedures. NOTE: Do not disconnect the wheel speed sensor connector. 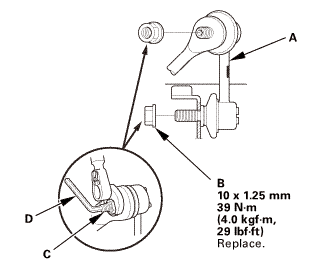 Remove the brake hose mounting bracket (B). 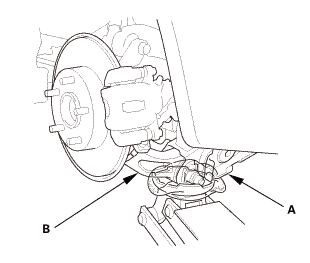 Position a floor jack at the connecting point of the trailing arm (A) and the knuckle (B). Raise the floor jack until the suspension begins to compress. 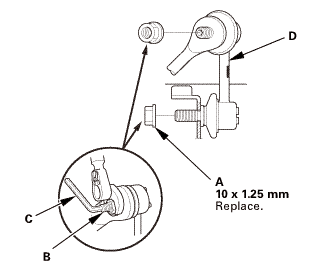 Remove the damper mounting bolt (A). 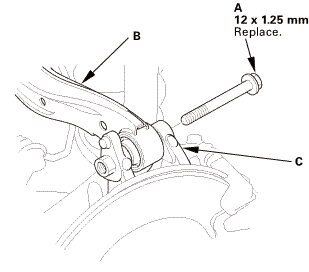 Remove the flange nut (A) while holding the respective joint pin (B) with a hex wrench (C). 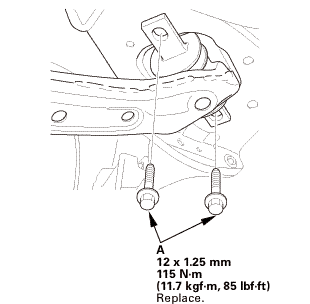 Disconnect the stabilizer link (D) from the trailing arm. 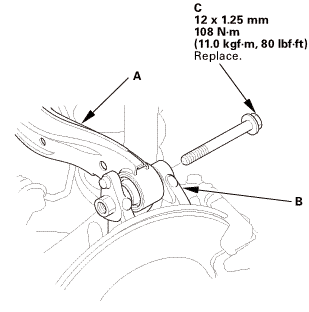 Remove the flange bolt (A). Disconnect the upper arm (B) from the knuckle (C). 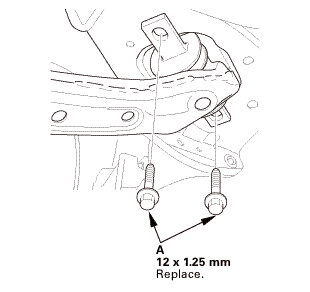 Remove the trailing arm front mounting bolts (A). Lower the floor jack gradually. 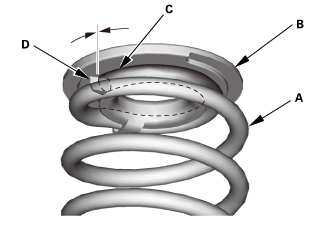 Remove the spring mounting cushion (A). 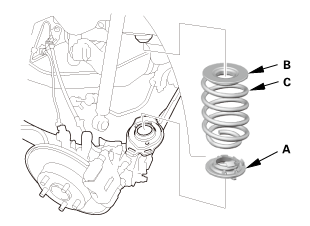 Remove the lower spring seat (C). 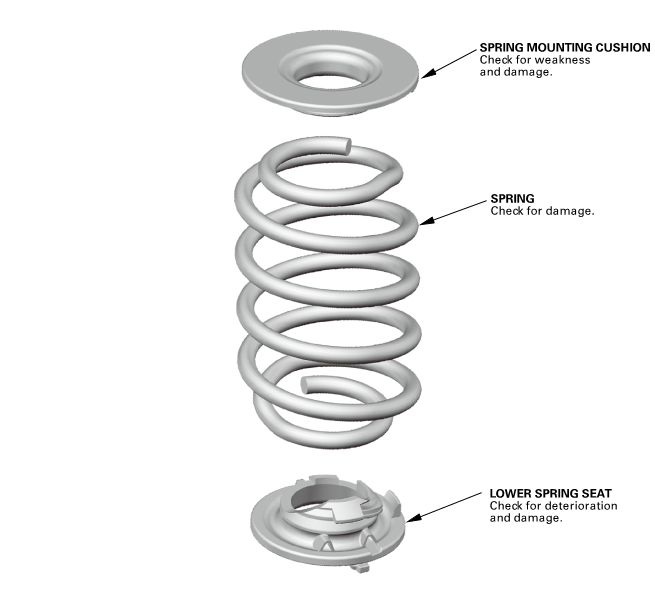 Install the spring (A) on the spring mounting cushion (B) by aligning the upper end (C) of the spring with the ledge portion (D) of the spring mounting cushion. 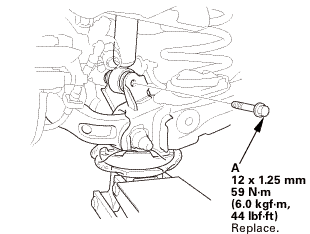 Install the lower spring seat (A). 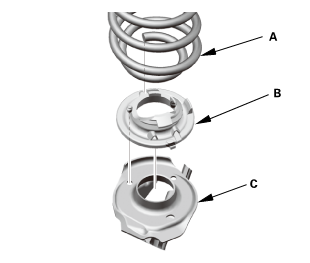 Install the spring mounting cushion (B) and the spring (C). 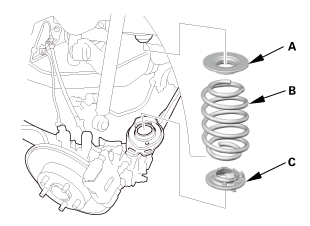 Align the bottom of the spring (A) and the lower spring seat (B) with the trailing arm (C) as shown. Loosely install the new trailing arm front mounting bolts (A). Connect the upper arm (A) to the knuckle (B). Loosely install the new flange bolt (C). Loosely install the new damper mounting bolt (A). 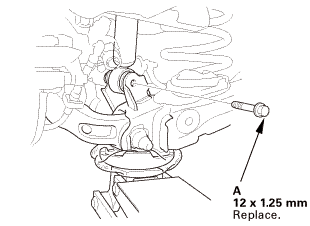 Connect the stabilizer link (A) to the trailing arm. Install the new flange nut (B), and tighten them to the specified torque while holding the respective joint pin (C) with a hex wrench (D). Raise the rear suspension with a floor jack to load the vehicle weight. Tighten all mounting hardware to the specified torque. Install the brake hose mounting bracket (A). 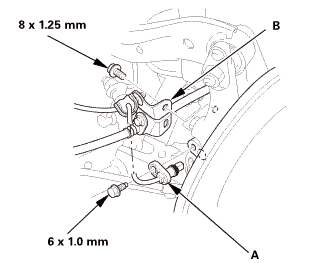 Install the wheel speed sensor (B). Release the parking brake to avoid an incorrect measurement. Make sure the suspension is not modified. Make sure the fuel tank is full, and that the tire repair kit, the spare tire, the jack, and the tools are in place on the vehicle. 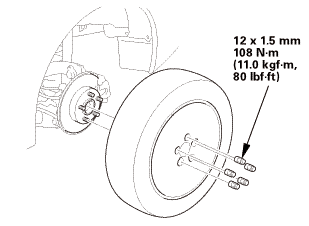 Check the tire size and tire pressure according to tire information. Use commercially available computerized four wheel alignment equipment to measure wheel alignment (caster, camber, toe, and turning angle). Follow the equipment manufacturer's instructions. If the measurement is within specification, measure the toe-in. 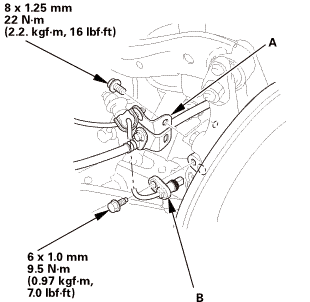 If the measurement for the front camber is not within the specification, go to front camber adjustment. If the measurement for the rear camber is not within the specification, check for bent or damaged suspension components. If adjustment is required, go to the rear toe adjustment. If no adjustment is required, go to front toe inspection. 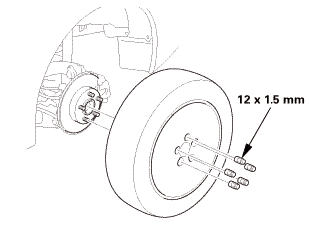 After 5 minutes of driving, torque the self-locking nut again to the specified torque.